We are surrounded by Pharmaceutical Misconception and I for one am getting frustrated with it. At Petrie’s Cottage we are seeing more and more clients who are pregnant, trying to conceive or know someone that is. It is important to have the essential nutrients during this important time. I have discussed in the past the importance of practitioner only products, in this case I have actually compared them for you. 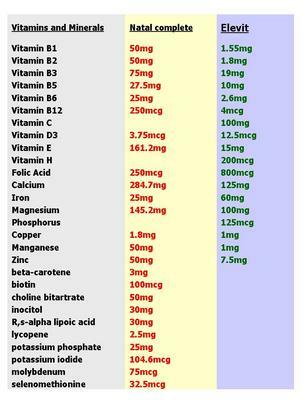 You can actually see the strength of the nutrients in practitioner only products compared to over the counter brands. In this example I have used a brand of product that doctors endorse and a Nutri-medicine brand called Natal Complete Multi. Mind you Elevit also contains sugar and talcum powder to help hold it together. You will be amazed at the difference… even I was. There is such huge that in some cases you would have to take 50 Elevit tablets compared to 1 Natal Complete. Although 800mcg of Folic acid is found in Elevit this dose is not needed unless there is a history of neural tube defects.